Tom Connors is a working musician. His edges are rough and his music is about specifics. People, places and events dominate his lyrics. He writes about the folks he has met as he traveled across the wide expanse of Canada. East and West, North and South, as Hank Snow would say, “He's been every where.”, and sat down and had drinks with folks of all walks of life. These are the inspirations for his music. He is not caught up in writing about general topics like love and cheating and blues. Instead he writes about ordinary people, almost always with a twist of humor. 'Ketchup Loves Potatoes' is a perfect example of his funny, musical, stories. They seems almost childish in the telling, but the lyrics are filled with emotion and meaning. This song's origins hark back to the folks he met while in Prince Edward Island, the smallest Provence of Canada. P.E.I., as the locals would call it, is an island, famous for its red soil. The main industry there, other than fishing, is growing potatoes or spuds as the islanders refer to them. So naturally, this song would center around potatoes, at least in a sense, but potatoes (ha..ha..ha..) are just a metaphor for life in general in P.E.I. Despite it's silly name this is an east coast love story. From time to time this song bubbles back up to the surface of my memories and takes hold of me once again. 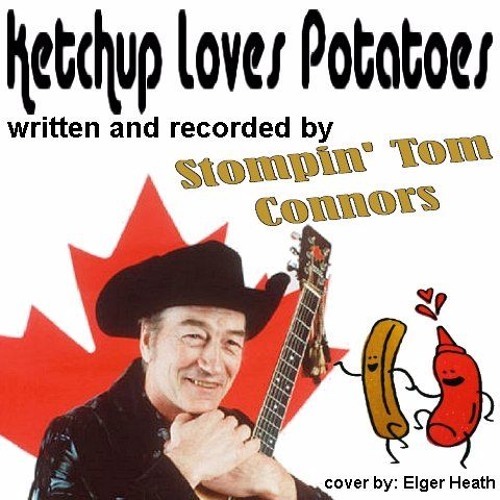 It is an affliction I would like to pass on to those of you, who might not be as familiar with Stompin' Tom Connors as I. I am no Tom Connors but here is my effort at covering one of his great many tunes, 'Ketchup Loves Potatoes'. I hope it tickles your funny bone.